Flying with a baby is rarely fun. 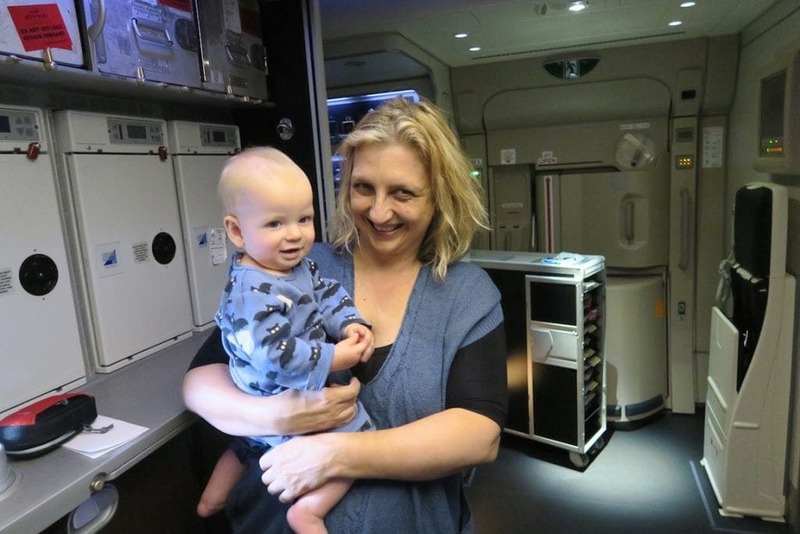 Accompanied by her 10-month-old son, SUE WHITE took a few deep breaths, and set off on a Sydney to Europe flight, during which she would put the promise of Etihad’s Flying Nanny program – ‘A helping hand in the sky’ – to the test! Adult passport: check. Baby’s passport: check. Three changes of clothes for the 10- month-old, one extra for me (just in case) and a swag of spare nappies? Check, check and check. Flying Nanny? Check. I’m about to fly long haul on Etihad Airways, where for the last couple of years an onboard nanny service has been part of the package. Sounds great, right? But surely it’s only available for those in first class? Nope. Business class then? Nope. For extra hard-earned cash on top of your international ticket price? Nope: access to the program is free for every Etihad passenger travelling with kids (and for unaccompanied minors). I can almost imagine a perplexed fan of Mary Poppins working behind the scenes at Etihad Airways conjuring up a solution. “Okay. So parents worry about flying long haul with their children. And other passengers don’t love noisy kids. How do we keep everyone happy?” Cue the Flying Nanny program. The airline sent a bunch of cabin crew to a top nannying school in the United Kingdom (Norland College) to learn about how best to help parents. Now, they ensure that one nanny (or more) is installed on every long haul flight to help families from the time of boarding until they exit. Still, everything sounds good on paper, but like most parents flying long haul with a baby for the first time, it’s with trepidation that I approach the whole experience. This is not just long haul, it’s uber long haul; Sydney to Europe courtesy of a 14-hour stint, backed up by another seven hours in the air. Checking my pram at the gate (another benefit of flying Etihad – I’ve kept it with me for the baby to nap at the airport) and looking down at my unsuspecting 10- month-old son, I wonder if he knows what lies ahead. Stepping onboard, we’re greeted by a smiling woman in an orange apron. “I’m Tracey, your Flying Nanny,” she chimes in a UK accent. Given Ollie is strapped to my body, Tracey can see he’s not on offer – but I can see she’d be happy to carry him if not. Instead, she grabs my hand luggage and helps us settle into our seat. It quickly becomes apparent we’ve scored a bassinette (most airlines will do this, although there’s often stiff competition depending on the number of babies on board), a neighbour with an 11 year old and a nanny who genuinely seems to love babies. It’s nice to hear, but what’s more reassuring is that Flying Nannies actually know what they’re doing. It’s easy to ‘want’ to help someone with a baby, but there’s an art to it. Talking to the Flying Nannies, I discover their training is about just this; before taking action, what will be the most useful – supporting the parent, or supporting the child? There’s also the small matter of sleep. 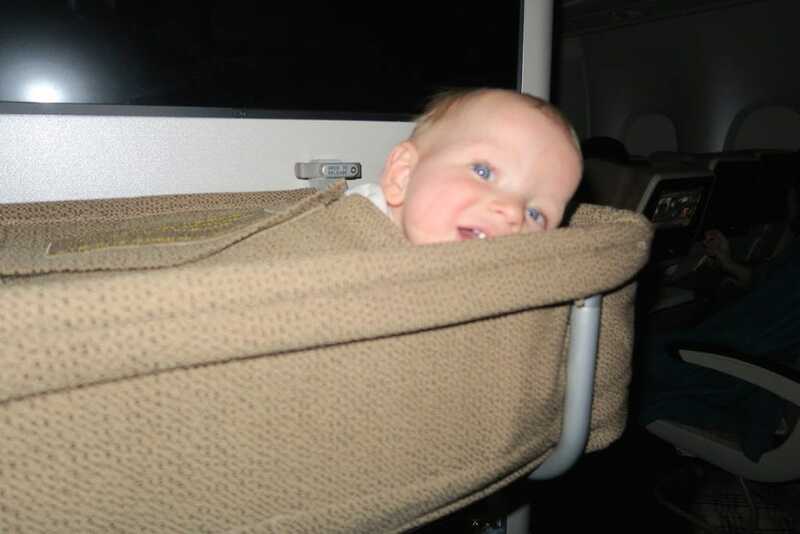 If you do happen to jag a bassinette, it pays to be forewarned that on most airlines, if your baby is asleep and the seatbelt sign comes on you’ll have to lift him or her out. It’s a sensible safety precaution of course, but one that leaves me feeling slightly trepidatious at the first sign of every bump. While it’s tempting to feign disaster for the nannies to work their magic, the final result is pretty low key. It’s something I often hear from parents flying long haul – the idea of it is usually worse than the reality. Ollie sleeps nine of fourteen hours on leg one (and even I clock about six hours). I eat, thanks to nannies ensuring the meals are well timed. I go to the toilet with someone keeping an eye on the sleeping bub. And I decide to test them out on the free nappies (yes, they exist). Still, it goes so smoothly I have to wonder. Is it the bassinette? My good-natured son? Or simply Tracey waving her magical stardust over the whole experience? Even during our nanny’s breaks, I feel like I’ve had to fight off cabin crew’s offers to hold my son, which makes organising my bags and actually functioning feel very civilised. But if they’re angling for a nanny role, they have some stiff competition. 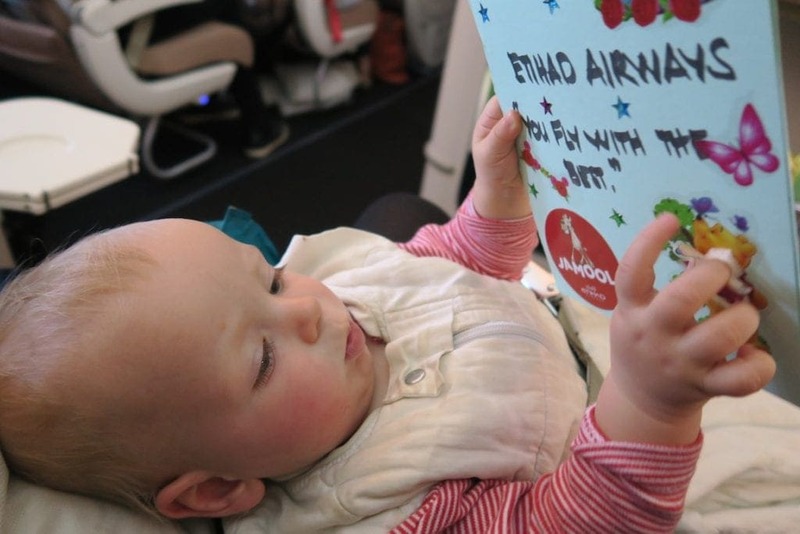 The pram is at the door, and so is Tracey, with a handmade card for Ollie to celebrate his first long haul flight. She’s delighted it went so well, and if delighted is a synonym for relieved, then so am I. The writer flew courtesy of Etihad Airways. 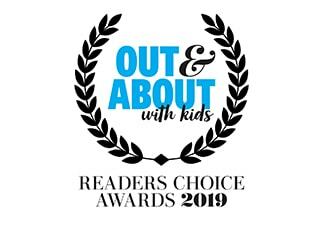 Sue White writes about travel with toddlers and shares all her adventures, misadventures, tips and advice at www.babieswhotravel.com. She also talks travel as founder of the active Facebook group for parents www.facebook.com/groups/kidswhotravel. 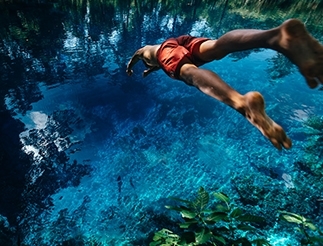 "Whether it's a weekend jaunt to see the grandparents or the trip of a lifetime involving long haul flights, we've got you covered."